The 2nd race in the club's new Trail Race Grand Prix was Saturday's Standish Hall Trail race near Wigan over about 10 kms. Hosted by Wigan Phoenix, this well established and well, organised event attracted about 250 runners.The race was won by Jon-Jo Doherty of St Helens Striders in 36:27. The women's race was won by April Caufield from Halifax in 42:23. 16 SWAC runners took part - 5 more than at Parbold Hill and showing good support for the Trail GP. Simon Coughlan led our group home running 43:33 for 19th place overall. Martin Sutton finished inn 46:45, Carl McMahon in 47:04, Neil Sillcock in 48:55, Paul Hill in 49:23, Graham Liu in 50:10, Clive James in 51:47, Mark Gillan in 57:06, and Billy Hargreaves in 60:16, 2nd M70!. Helen Lavelle led our women home in 54:33. 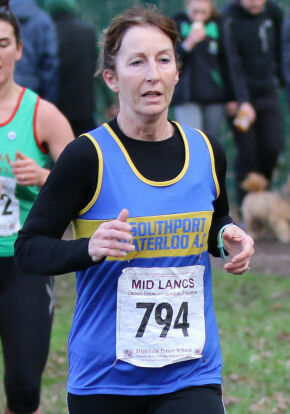 Helen Lodge ran 58:14, Sue Stewart in 58:27 - winning her F70 age category - Catherine McElhinney in 60:23, Lynn Vickers in 65:43, Jane Blacklin in 66:28 and Elaine Sutton in 67:49. A Trail GP table will be included when available. Six of our runners traveled to the Harewood House estate in Leeds - the venue for last year's Northern Championships - for the English National Cross Country Championships on Saturday. It is testing course but well suited to the big field national championships. Jessica Deans' Under 17 Women's race was the first race of the day over 5 kms. 220 finished the course, Jess well up in 133rd place in 21:57. Sister Emily ran in the Under 13 Girls' race over 3 kms. She was 172nd of 418 finishers in 12:46. Both Luke Ward and Sammy Pickerill ran in the Under 13 Boys' race, also over 3 kms. Luke was 122nd of 408 finishers in 11:34, an excellent run from a young man who has been running Mid Lancs this season as an Under 11 and only qualified for this race on reaching his 11th birthday. Sammy was 321st in 12:59. In the Senior Men's race, Andrew Kershaw and Alex Waddelove joined over 2000 others for the spectacular last race of the day. Andrew ran 43;24 for the 12 kms, finishing 359th, and Alex finishing in 48:00 for 833rd place. 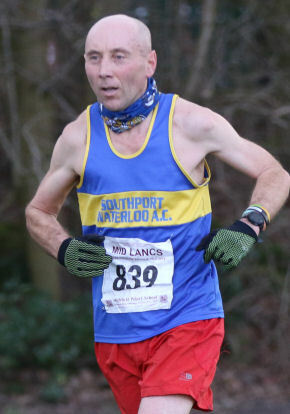 Steve James who travelleed to Leeds to support our runners adds: The estate grounds provided the most beautiful setting I've seen for a 'National', the weather was very good, and the course was hard but dry and fair. It was a pleasure just to be there. It seemed a pity that more SWAC runners were not there, when this great event may not be so accessible again (just over 2 hour's drive) for many years. 4 Southport Waterloo Athletes travelled up to Glasgow to take part in the Scottish National Combined Events and Individual Masters cHAMPS. These Athletes were masters athletes Clare Constable and Ian Fitzpatrick and junior combined eventers Katie Piercy and Amber Hughes. Both Ian and Clare took part in 800m races in their respective age groups and both came away with a medal. Ian took Bronze in a time of 2.26.78 and Clare took the Gold medal in her race in a time of 2.28.10. Both these athletes were using this event as a warm up for the World Masters event that is held in Poland in 5 weeks time and we wish them both good luck at those championships and can't wait to hear how they get on. Katie and Amber took part in the Under 15 Girls' Pentathlon and both recorded personal bests for the event. Katie jumped 1.31 in high jump, ran a PB 10.27 for hurdles, long jumped 4.23, putt the shot 9.08 and rounded off her day with a 3.04 800m for an overall total of 2237 and an 18th place finish out of the 39 entries. Amber also had a good day high jumping 1.37, running hurdles in 9.72, long jumping a PB 4.72 before improving her own club record in the shot to 9.94. She finished the day with a 2.43 800m which was good enough for a 5th place overall finish and a total of 2788 which replaces Katie's club record which she achieved last year. Again both these athletes were using this event as a preparation this time for the English combined events nationals on March 9/10 were they will be joined by club colleagues Niamh Procter, Drumayne Moore and Sam Coupland so good luck to all in those championships. Ed: There were more of our athletes, mainly sprinters, competing indoors at the Sale Harriers indoor meeting in Manchester.Over 60m, Harry Flanagan had a best of 7.22, Joe Kane 7.44, Chris Burgess a SB 7.87, Darion Moore 7.94, Ethan Harrison 7.99, Marcus Burgess 9.00 and Amy Bloxsome a SB 9.19. Over 200m, Harry ran 22.66, Ethan 24.98, Marcus 25.42, and Darion 25.90. Taking on the 3-lap 600m, Graham Boreham ran sub 90 for the 3rd time this winter finishing in 1:29.37. Lilly-Ann Grayson in her first indoor meeting ran a PB 1:47.03. Ben Apps improved his long jump PB by 25 cms with a 6m 56 clearance. The 49th Parbold Hill Race took place at Richard Durning's Primary School, Parbold on Saturday 16th February at 2pm. With perfect weather conditions, it was ideal for the first of the SWAC Trail Race Series. Ground conditions were good for the demanding 6.7 mile course compared with previous years. After the two main climbs in the race, woodland tracks with some rocky areas and deep mud provided the usual challenges for the runners. Due to the clear weather, the view from the top of Parbold and Harrock Hill were brilliant. Thanks to Skelmersdale Boundary Harriers for a well organised race. There were 461 finishers with Thomas Griffiths from St. Helens Sutton the first man in at 40.26 and the first lady was Debbie Campbell from Liverpool Pembroke Sefton in at 49.40. SWAC runners were Simon Coughlan 50.52, Paul Hill 1.00.07, Neil Silcock 1.00.11, Graham Liu 1.04.40, Sue Stewart 1.12.21, Paul Carlin 1.13.17, Helen Lodge 1.14.53, Catherine McElhinney & Caroline King 1.20.55, Elaine Sutton 1.25.47 and Dennis Fenna 1.27. Well done to Sue for winning her Vet class. Roll on the Harrock Hill races! 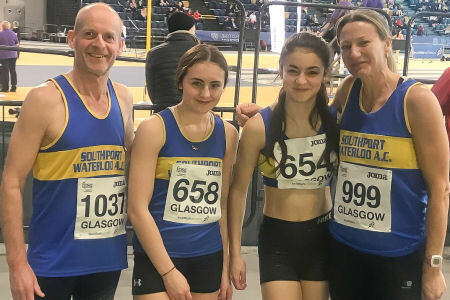 The Sale Harriers indoor open series in Manchester continued on Sunday and five Southport Waterloo athletes took advantage of the graded competition with 1 improved club record, 2 PBs and 2 SBs. Stephanie Robertson equalled her 8.25 secs 60m PB set at the Northern indoor championships last month. In the 60m hurdles she improved her own Under 17 club record with 9.22 secs, a much better run than at the Northern indoors. Lauren Lewis ran 8.18 for 60m and long jumped 4m 90. Abi Bamber ran a Season's Best 8.38 for 60m. Chris Burgess ran a Season's Best 7.89 for 60m and 25.59 for the 1-lap 200m. And finally Ben Apps cleared a best of 6m 31 in the long jump; a new PB. His previous best was 6m 17 so that's a great achievement! 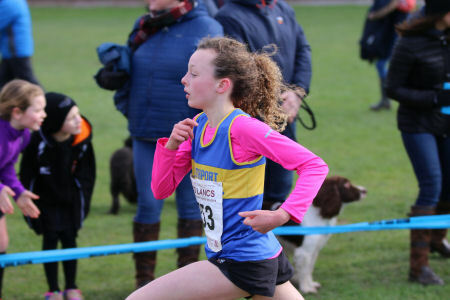 The Liverpool & District's senior Cross Country Championships were held at Clarke's Gardens on Sunday. Last year the weather backdrop was high winds and hail so it was much more benign this year, the gale force winds of the last couple of days having moved east. The course away from the Start / Finish field was again wet, muddy and a little slippery, however, and a minor course diversion was necessary to avoid a fallen tree! Last year, numbers were good at 154 finishers with the introduction of a Women's team award, the women contributing about a quarter of all the runners. This year, numbers were even better with 195 finishers. 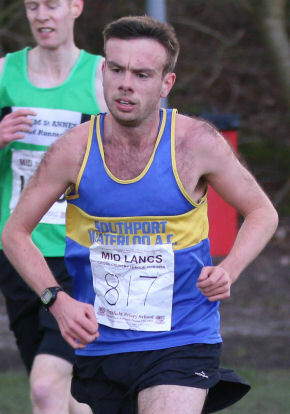 The overall race was won by Tom Griffiths, St Helens Sutton, in 31:15 for the 3-lap circa 6 mile course. Chris Maher, Liverpool Pembroke & Sefton, was 2nd in 31:47 and Alistair Rutherford, Liverpool Harriers, 3rd in 31:53. LPS won the team award with Liverpool Harriers 2nd and St Helens Sutton 3rd. Tiffany Penfold, LPS, won the women's race in 35:13. Emily Gray, Liverpool Harriers, was 2nd in 39:01 and Debbie Campbell, LPS, 3rd in 39:11. LPS won this team race with UTS 2nd and Wallasey 3rd. With a Mid Lancs fixture the day before and other runners unavailable for a variety of reasons, Southport Waterloo had 9 male runners - no women - on the Start line. Alex Waddelove was always our lead runner and he finished 31st of the 195 finishers in 35:18. James Paybody was 38th in 36:25, Mike Taylor 47tth in 37:22, John Sprackland 57th in 38:41, Carl McMahon 97th in 41:38, Martyn Smyth 115th in 43:16 and Graham Liu 132nd in 45:28. With 6 to count we were fortunate to finish a team; Stephen Ward went over on his ankle and Stephen Flanagan suffered a groin strain so two of our runners were forced to withdraw. Hopefully both will make a speedy recovery. Our team finished 9th of 12 today, on 385 points equal to UTS who took 8th place as their last runner was ahead of our last runner. Last year we finished 4th but with significant absences that was unattainable this year. Thanks to our hard-working Team Manager - and a past President of the L&D - Steve James. Full results on the L&D web site. 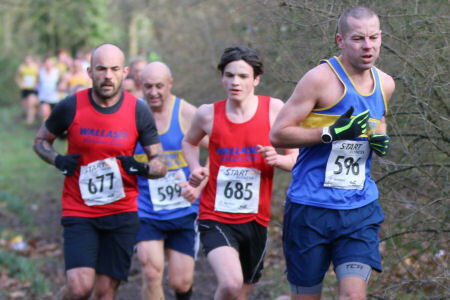 A full weekend of cross country running started on Saturday with the Northern Masters Cross Country Champs running from the Knights Grange Leisure Complex, Winsford. Running over the 5 km course, club president Steve James took the M80 category gold medal to add to his impressive collection of Masters successes. The meeting was not as well attended as was hoped but the club's Rob Johnson was also competing there. This report will be updated when the results are published. Update: Rob Johnson was 2nd in the M60 category race over 8 kms so takes a Silver medal. Great running from both Steve and Rob. Having run his own championship race, Steve James then headed north to Leigh to support our runners at the penultimate Mid Lancs XC League fixture and to team manage our senior men. The Leigh Sports Village course is not ideal cross country having too much stoney and hard paths but its generally well liked with varied terrain starting on a flat field, out through woodland and on into Pennington Park close to Pennington Flash. In the past, this has proved a very muddy venue but it was generally pretty good underfoot on Saturday and even the tented area was relatively mud-free. The main problem initially was the gale force winds that whipped through the Start / Finish field making it very difficult to erect tents. Our own tent was uprooted and blown 50m until help arrived to erect it securely. Those running at Leigh would have noticed the very long finish funnel designed to help cope with the 100s of under 11s we had at Burnley. In fact, we had only (!) 78 Under 11 Girls and 84 Under 11 Boys. It is a major boost for any sport to see so many youngsters taking part. There aren't that many in the older junior age groups but if good numbers of today's Under 11s stay in the start the future will be bright. Southport Waterloo had no Under 11 girls competing. We did have two Under 11 Boys in Luke Ward and Stephen Morgan. Luke was a brilliant 6th of 84 finishers in 7:42 for the (longish) 2.3 kms. Stephen was 49th in 9:07, still well up in the middle of the field. Emily Dean ran in the Under 13 Girls' race where she ran a really strong finish for 21st place of 48 girls in 8:31. 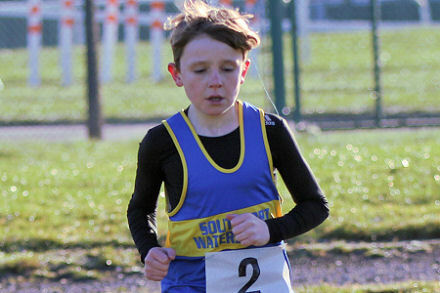 In the Under 13 Boys' race Reuben Donnelly competed in a club vest. He was 25th of 47 finishers in 10:37 for the 3 kms. Once again, Olivia Logan was impressive in winning the Under 15 Girls' race in 9:24 for her 3 km medium lap. Running with the Under 13 Boys, she had just one boy in front of her at the end. My sense is that she has now firmly established herself as the fastest Under 15 Girl in the League and is now focused, rightly I believe, on challenging the fastest Under 13 Boys! Millie Ireland also ran in this race finishing in 12:46. We had no Under 15 Boys. In the Under 17 Women's race both Jessica Dean and Freya Walsh were competing. Jess was 6th in 14:11 for her 4 kms with Freya 12th in 16:02. We move then on to the Seniors and had 8 running in the Senior Women's race, including a new and very welcome surprise. Tracey Allan ran really well for 12th place overall of 155 finishers. She completed the 6 km course in 21:45. 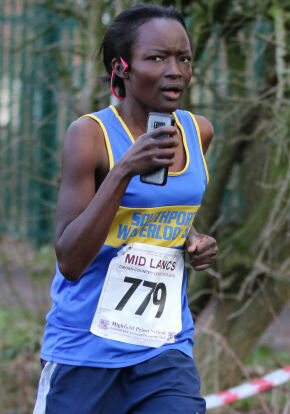 Southport Waterloo's 2nd place finisher was new member Zana Ladipo who was 39th overall in 23:53. I'm not sure if she has run cross country before but is clearly a very welcome addition to the team! Team manager Michelle Spencer was 44th in 24:23 such that Tracey, Zana and Michelle were 9th team overall and 3rd LV35 team. Carole James completed in 25:42, Ellie Ireland in 25:52, Catherine McElhinney in 28:34, Caroline King in 29:40 and Katy Coupland in 29:57. Carole, Catherine and Caroline were 12th LV45 team. With the Liverpool & District Cross Country Champs scheduled for the following day, our Senior Men runners would be split but in fact 15 ran at Leigh and several even raced both days. Leading the team home again at Leigh was Francois Rafferty, running a very good 19th place overall and 1st MV50 in 35:39. Alex Waddelove was next, 33rd in 36:58, then Anthony Pratt 67th in 38:38, Peter Roome 78th and 4th MV50 in 39:22 John Sprackland 100th and 7th MV50 in 40:17 and Richard Talbot 119th in 41:55. That was the 'A' team, finishing 9th team overall. Other finishers were Neil Adshead (43:16), Keith Swift (44:27), Neil Silcock (45:57), Paul Hill (46:44), Graham Liu (47:38), Malcolm Teale (48:01), Clive James (48:48), Mark Gillen (51:44) and Ian Pike (55:29). Francois, Peter, John and Richard were 5th MV40 team and Francois, Peter and John won the MV50 team race where Southport Waterloo are already League winners. PS I have a Puma UK S mottled red hoodie with black trim left in tent. 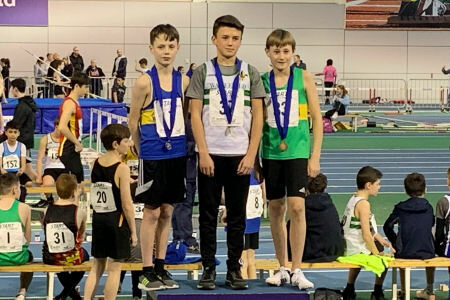 The Northern Under 13 and Under 15 Indoor T&F championships took place on Sunday at the EIS Arena in Sheffield. As a timekeeper on the day, I can tell you that we timed 87 races, an indication of a long and busy day at this well attended championships. The overall number of event entries was, at 583, exactly the same as last year but down on previous years. What was particularly interesting, however, was the numbers broken down by gender. There were 421 girl event entries compared to just 162 for the boys. I'm sure the disparity in favour of girls in the sport comes as no real surprise but surely gives us food for thought on what might be and the opportunities boys are currently missing out on. But back to the athletics! 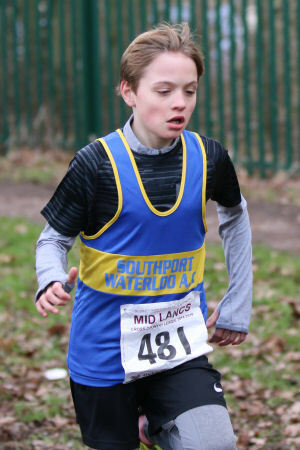 Southport Waterloo was represented by seven of our talented young athletes; Under 13s Lauren Byrne, Charlotte Hughes and Adam Byrne; and Under 15s Amber Hughes, Niamh Procter, Sierra Jalloh and Katie Piercy. Lauren Byrne cleared a best of 1m 30 in the high jump, and put the shot 6m 71. in the 60m sprint she ran a PB 9.18 in her heat to qualify for the semi final where she ran 9.33. Charlotte Hughes achieved a massive PB in the shot with a put of 4m 95. In her 800m race, she ran 3:02.96, just outside her PB set in the same stadium last October. Adam Byrne competed in both the high jump and the shot and achieved PBs in both. He cleared 1m 35 for a 4th place finish in the high jump but was rewarded with a Northern silver medal - and his first entry in the club Roll of Honour - for a 2nd place finish in the shot, improving on his own club record for the 3 kg weight throwing 7m 05. that was only 3 cms short of the gold medal performance! Amber Hughes was up against some tough opposition in her three events. In her first event, in pool 1 of the high jump, she cleared 1m 40 and much later in the day in the shot she was 7th with 9m 37. In the 60m hurdles she was 3rd in her heat in 9.89, then 2nd in the semi final with 9.72 making it through to the Final where she ran 9.85 for 6th place. Amber won 6 Northern medals last year as a 2nd year Under 13 and I confidently expect the same next year as a 2nd year Under 15! Niamh Procter long jumped 3m 98 and ran 9.00 in the 60m, her first time in the indoor short sprint. Sierra Jalloh had a very busy day! in just two events. In the 200m, she ran 27.76 for 2nd place in her heat, then was 2nd again in Round 2 in 27.38. In the semi final she finished 2nd again in 26.79 to qualify for the Final where she was 6th in 27.68; all very consistent running. Over 60m, she ran 8.42 to finish 3rd in her heat before going on to run 8.40 in her semi final. In fact, both her 60m times were PBs so she can be very happy with that! And Katie Piercy competed in the shot where she had a best of 9m 21 and she ran a PB 10.42 in her heat of the 60m hurdles. That's 7 PBs achieved at these championships to go along with Adam's silver medal and club record. Excellent! Well done to them all and to their supportive coaches and parents. One final point and perhaps more food for thought (although I have no solution to offer). Championships with large entries can mean that track sprint events can necessarily have to go through several qualifying rounds to get to a Final. Sierra's Under 15 Girls' 200m had 4 rounds! That meant that she had 6 races on the day and the situation could have been worse if she had entered a 3rd event. With three rounds in the Under 15 Girls' 60m hurdles, Amber had to compete 5 times. This compares with the UKA age group Rule limiting athletes to 3 events plus a relay! The club's 2019 Grand Prix of Road Races kicked off on Sunday with the Mad Dog 10K in Southport which attracted over 3000 finishers. The race, again voted the best regional 10K race in the North West by the National Running Awards, is organised by the Southport Hesketh Round Table and so generates lots of money for local charities. 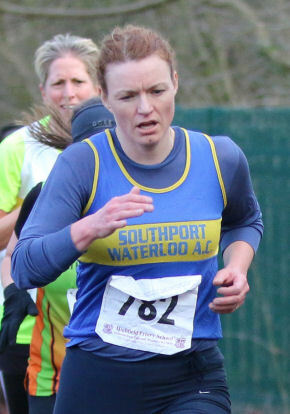 Places were sold out to their limit this year but at least 41 Southport Waterloo runners managed to get a place and recorded a finish on Sunday. The overall race was won by Red Rose runner Simon Croft in 33:57 with Salford Harrier Paul Bannister 2nd in 34:41 and Liam Turner from Sheffield Steel City Striders 3rd in 35:14. LPS' Kirsty Longley won the Women's race - finishing 5th overall - in 35:30. Helen Sahgal, also from LPS, was 2nd in 39:08, and Kirkby Miler Carmel Triggs was 3rd in 39:42. 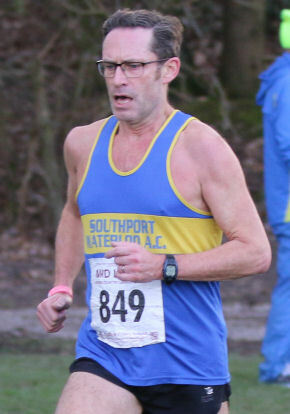 The Southport Waterloo runners were led home by Francois Rafferty, 4th overall in the race and 1st MV50, in 35:24. Sam Moran was next, 20th overall in 38:21, David Wright 25th in 38:55, Stephen Ward, 27th in 38:56, and Keith Lunt 33rd in 39:11. The long list of finishers continued with Boyd Pak, 40:02, Keith Swift, 40:51, Paul Warrington, 41:22, Mike Walker, 41:59 and 1st MV65, Carl Pedder, 43:01, Jeff Caunce, 43:52, Stephen Flanagan, 45:34, Paul Hill, 45:47, Malcolm Teale, 46:18 and 3rd MV60, James Brooker, 46:52, Graham Liu, 47:32, Charles Warrington, 51:10, Paul Carlin, 52:46, Simon Pickerill, 57:30, Lee Coupland, 58:41, and Keith McKiernan, 72:56. Tracey Allan was our leading lady, 5th female overall and 3rd F35 in 40:32. 'Fresh' from her schools cross country run on Saturday, Jessica Dean was our 2nd female finisher and the 1st non-vet female overall, in 42:37. Sharon Spencer was 19th female in 45:39, then Tracey Barlow, 48:02, Sarah Lunt, 51:26, Helen Lodge, 51:26, Pat Kearsley, 53:09, Sue Stewart, 54:05 and 1st F65, Jane Blacklin, 57:19, Aisha Taujanskas, 60:10, Sophie Bennett, 60:17, Sandra Teale, 60:28, Emma Hopwood, 60:56, Sarah Pickerill, 62:00, Lesley Syms, 62:00, Katy Coupland 62:38, Michelle Carlton, 68:48, Heather Goadsby, 70:13, and Gill Gillison, 73:29. Surprisingly few runners took advantage of the rare opportunity to run inside the famous Aintree Race Course when Merseyside Schools AA held their cross country championships there today. The Aintree Grand National venue would have been an attraction for some but the course itself was flat and almost totally lacking in interest as the runners ran loops within the horse-racing circuit. And with early morning frost on the ground we could only gain access to the Start / Fiinish area by walking about a kilometre around the race course to cross over by the Melling Road. But it was a sunny if cold day with light winds and a fairly good running surface. The first 15 in each race received a letter inviting them to give their availability to represent Merseyside Schools at the English Schools national XC Championships in Temple Newsom, Leeds, on Saturday 16th March. Counties declare teams of 12 with 8 competing and the first 6 counting for the team. Despite sparse schools' attendance, we might have expected more than the 11 or so members of Southport Waterloo who took part; difficult for your correspondent to easily identify as most wore school colours..
We had two runners in the Year 7 Boys' race - Sammy Pickerill and Will Collins. Sammy finished 13th of 27 in 14:17 for the small + two medium laps, about 2.5 kms. Will was 19th in 14:51. The Inter and Senior Girls ran together over 2 large laps for about 4 kms. Olivia Logan continued to dominate and took her 2nd Merseyside title completing the course in 14:19. Senior Girl Jessica Dean was 10th overall in 15:47 and Alice Bird finished 25th in 20:47. Freya Walsh also started but was forced to drop out after one lap. 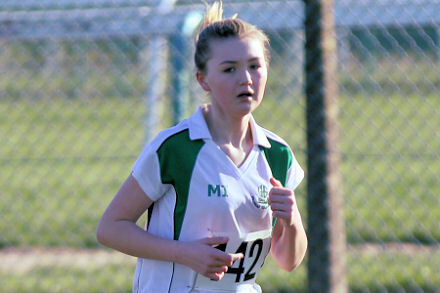 Emily Dean was the only club interest amongst the 19 runners in the Year 7 Girls' race; two medium laps for about 2 kms. She finished an excellent 2nd in 10:15 and was a scoring member of the 2nd placed Sefton team. The Junior Girls' race was the largest of the day and included four Southport Waterloo girls. Elizabeth Wake was our first girl home, 12th overall in 18:11 for the 2 medium laps, 2 kms. Libby Simpson, struggling with a knee injury, was 21st in 19:55, Millie Ireland 27th in 21:18 and Maisie Bird 32nd in 23:26. The Merseyside selectors met on Monday evening to finalise the teams for the Inter Counties Cross Country Championships at Prestwold Hall, Loughborough, on Saturday 9th March. The first batch of selections was made following the County Championships on 5th January at Sherdley Park with further selections made based on performances at the Northern Championships last Saturday. U13G Emily Dean: U15G Olivia Logan; U17Gs Jessica Dean and Freya Walsh; with Tracey Allan a Senior reserve. U13B Monty Barr; U17M Harry Pike; with Ben Johnson a Senior reserve. Full M'side teams on the county web site. Copyright © Southport Waterloo Athletic Club 2019. All rights reserved. Southport Waterloo AC is affiliated to England Athletics and UKA and is Clubmark accredited to signify our commitment to being a safe, effective and child-friendly athletics club.